The item Batman : detective comics, Volume 7, issue 975-981, Batmen eternal, James Tynion IV, writer ; Javier Fernandez, Eddy Barrows, Alvaro Martinez [and 5 others], artists ; John Kalisz [and 3 others], colorists ; Sal Cipriano, letterer, (electronic resource) represents a specific, individual, material embodiment of a distinct intellectual or artistic creation found in Kent District Library. Following the tragic death of one of their own, Batman's team of vigilantes falls apart! With his squad completely shattered, Batman must confront Red Robin about the future of their partnership...if there even is one in BATMAN: DETECTIVE COMICS VOL. 7: BATMEN ETERNAL! Following her deadly actions in their last adventure, Batwoman faces scrutiny from Batman and Red Robin but stands up for her actions. Will Batman allow her to continue bearing his symbol after everything she has done? And will the fallout put these cousins--Bruce Wayne and Kate Kane--at irreconcilable odds with one another? 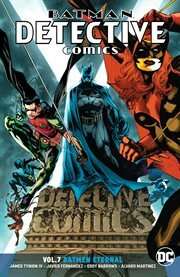 From writer James Tynion IV (BATMAN/TEENAGE MUTANT NINJA TURTLES) and a spectacular art team including Alvaro Martinez (BATMAN ETERNAL) comes the newest volume of DETECTIVE COMICS!